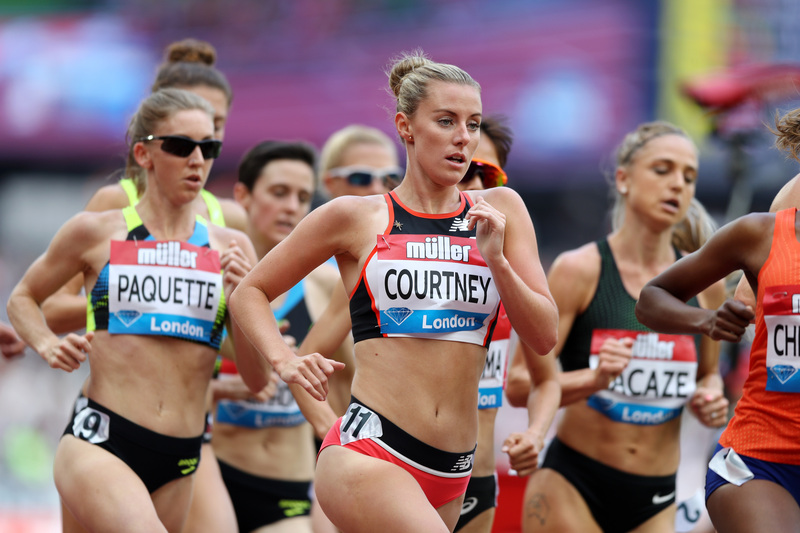 Melissa Courtney geared up for a potential showdown with fellow Briton Laura Muir at Glasgow 2019 by posting a sensational world-leading time in Germany over the weekend. The Commonwealth bronze medallist stormed to 3000m victory in a competitive field in Karlsruhe, setting a Welsh record of 8:43.36 in the process. Improving her previous indoor best by over 10 seconds, Courtney showed she is in the form of her life ahead of next month’s European Athletics Indoor Championships (EAIC). And fascinating head-to-head may await on the opening Friday evening at the Emirates Arena, with Muir reigning champion over both 1500m and 3000m. Courtney’s world lead was not the only British success story of the weekend, with Reece Prescod and teammate Kristal Awuah both tasting glory in the 60m at the ISTAF Indoor in Berlin. A silver medallist at 100m in last year’s European Championships, 22-year-old Prescod kicked off his season in perfect fashion by posting a European-leading time of 6.53 seconds in the German capital. Awuah, meanwhile, put down her own marker ahead of Glasgow 2019, pipping European 100m silver medallist Gina Luckenkemper in a time of 7.19 – a personal best for the young sprinter. When it comes to the EAIC, Czech sprinter Pavel Maslak is about as close to royalty as it gets. Heading into Glasgow 2019 with three successive indoor titles under his belt, the 400m specialist will look to make it an unprecedented four out of four in the two-lap discipline next month. And on the weekend’s evidence, Maslak is poised to mount yet another charge to the podium, posting a time of 46.78 to win in Berlin. The return to form comes at just the right time for the 27-year-old, who admitted after the race that his focus has been on hitting his stride at just the right time for Glasgow. “It was as a very difficult race,” he said. “I had to fight hard in the first round to not to lose contact with the leading runners. The entry list really suited me well. I like it to have someone in front of me who makes the pace and to whom I can try to stick to. Elsewhere, a host of other top European athletes ramped up their preparations for Glasgow with dominant displays across the globe. Bidding to make it three EAIC wins on the bounce, Greek pole vaulter Ekaterini Stefanidi lept to 4.71m in Karlsruhe to take joint-first alongside Canada’s Alysha Newman and Anzhelika Sidorova. Stefanidi’s success in Karlsruhe was emulated by Polish sprinter Ewa Swoboda, who posted a world-leading time of 7.08 in the 60m heats before then taking victory in the final in a slightly slower 7.10. After claiming the notable scalp of Dutch star Dafne Schippers in Germany, Swoboda will now look to improve on her bronze medal in Belgrade when she competes at Glasgow 2019. The other standout performance of the weekend came in Berlin, where reigning European long jump champion Malaika Mihambo delighted the home crowd to produce a stunning 6.99m leap that sets her up perfectly for next month’s action. “I hope I can top that this winter and finally get the seven metres,” she said. “But I am in really good shape and want to prove that at the coming events and get a new PB.